Scientists rely on hunters in Greenland to help them understand polar bear populations there. When trying to learn more about the polar bear population in Greenland, start with the people whose job is to know them best: polar bear hunters. In a new study released in the journal Frontiers in Marine Science, researchers detailed the wealth of knowledge full-time polar bear hunters in East Greenland have of both the animals and the environmental changes happening around them. Scientists and conservationists can then use this traditional ecological knowledge to better understand the environment they are studying — and identify new directions for further research. Lead by Kristin Laidre, principal scientist at the Polar Science Center at the University of Washington, the study set out to document how full-time hunters in East Greenland navigate the areas they hunt, what kind of environmental shifts they were witnessing and how the local polar bear population has changed in the last 10 to 15 years. The study focused on two areas in East Greenland with the most active polar bear hunters — Tasiilaq and Ittoqqortoormiit, separated from each other by roughly 500 miles on Greenland’s southeast flank. Local interviewers asked 25 full-time hunters a series of 55 questions, ranging from how often they hunt polar bears to whether they have observed changes to sea ice and glaciers. Only full-time hunters can hunt polar bears in Greenland, although, in both locations, their numbers have declined since 1996. “This is something that we see across Greenland, the number of people wanting to be full-time hunters is decreasing,” Laidre said. The hunters talked about how their hunting patterns have been affected by changes in the sea ice, which has become thinner and is forming later in the winter. All of the 15 hunters interviewed in Tasiilaq said they now hunt more using boats than dog sled when compared to 10 to 15 years ago, similar to many Ittoqqortoormiit hunters. “We used to go on sledges in October but now we go late December. Soon I will also need to use more boats and sailing for hunting, like many others,” said one 56-year-old hunter who was quoted in the study. Hunters in both locations also observed shrinking glaciers, receding sea ice and changes in the weather, including stronger winds, more frequent storms and warmer temperatures. When asked if these changes have impacted the polar bear hunt, 78 percent of all the hunters who responded said yes. This included hunting areas changing due to thinning or receding sea ice. In 2006, Greenland introduced a quota system for polar bear hunting, based on the average annual catches in areas between 2000 and 2004. After slightly raising the quotas in 2007, they now stand at 25 polar bears per year for Tasiilaq and 35 per year for Ittoqqortoormiit. When asked about their catch levels since the quota, 47 percent of Tasiilaq hunters said they were unchanged and 50 percent of Ittoqqortoormitt hunters said they catch more than they used to. The majority of hunters from both areas also observed there were more polar bears coming into their town and settlements. The hunters attributed this change to a variety of reasons, including the quotas, changes to sea ice and restrictions on the polar bear catch, where hunters are banned from shooting females with cubs, dependent cubs and bears in dens. Laidre worked on a similar study released in 2011 that described conversations with 72 hunters in the Qaanaaq and Upernavik municipalities in Northwest Greenland. The findings are detailed in a 200-plus page book, many of which were similar to those of the East Greenland hunters. This included a reduction of sea ice over the years and an increase of polar bears in hunting areas. Scientists have long used memories and environmental knowledge gathered by local residents over hundreds or thousands of years. Such contributions have helped biologists and naturalists like Charles Darwin and C. Hart Merriam, one of the founders of the National Geographic Society. Today, traditional ecological knowledge is used when making conservation decisions, as when the U.S. Fish and Wildlife Service used such knowledge along with scientific data to make a case that the polar bear be listed as a threatened species. 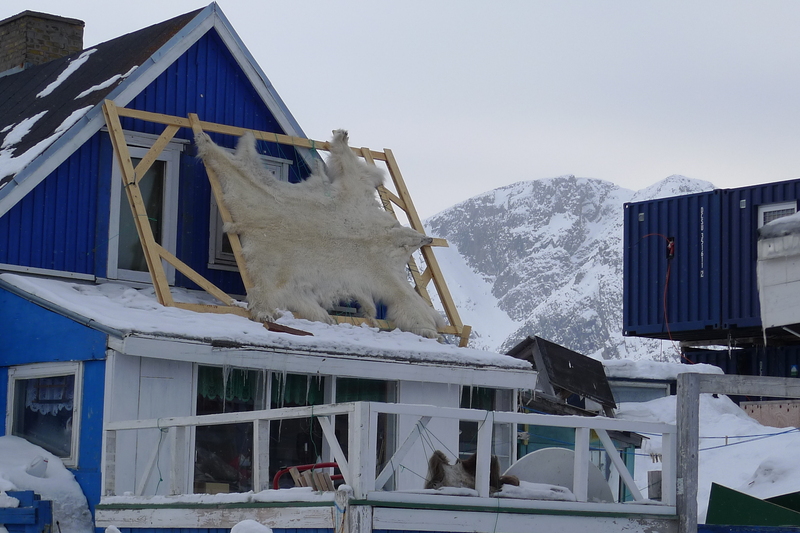 Laidre says that this survey of East Greenland polar bear hunters is one of the first steps to assess polar bear populations in the region, information that could help conservation decisions. During the interviews, hunters were offered maps to mark down areas where they have witnessed high polar bear concentrations, information that Laidre used when she went into the field in 2015. “I followed [the maps] and made sure that I went to the areas that the hunters thought were important. And every single area they told me to go, there were lots of polar bears,” said Laidre.